The iPad to Hit Shelves this Friday and Apple’s Announcement Has a Surprise Other than the iPad “3”? According to Leo Laporte, on This Week in Tech (TWiT), the iPad is hitting the shelves this Friday, the 9th. 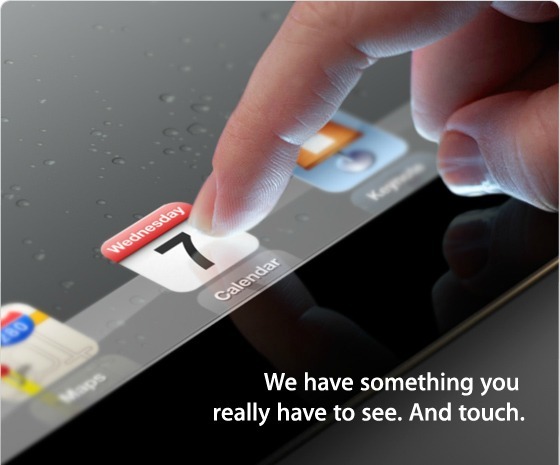 This means that on Friday, we will be able to get our hands on the next generation iPad, and possibly buy one. According to TWiT, the pricing of the iPad 3 will be the same as the current price for the iPad 2 today. It is also expected that Apple will still offer the iPad 2 for sale at a reduced cost. So, if you plan to buy an iPad 2, WAIT A FEW DAYS! You can potentially save a lot of money when the iPad 3 comes out. But the iPad 3 may not be the only thing that you might want to look out from Apple in the next few days. Apple is set to make some iPad announcements on Wednesday, March 7, 2012. But, according to CNet’s Buzz Out Loud, the next iPad isn’t the only thing that Apple has in its sleeve. Expect to be surprised by something other than the iPad. What might that other thing be, you may ask? I am going to guess that it will be something to do with the much rumored Apple’s television initiative. We will learn all about this tomorrow; so don’t go away! Previous Previous post: We Have Some Customized Windows 8 Consumer Preview Wallpapers for You!